No matter how old you are, you’re never too old to get started in hockey. Choosing a stick can be one of the most challenging parts of getting started in the sport, but we’re here to help. We’ve put together this hockey stick buying guide to help you choose one that will make your game that much better and more satisfying. Before we get started, let’s take a look at some of the things that you should know. Size: The size of the stick refers to the length of the stick in inches. This can affect what position the stick is best for, as well as how easy it is to play with and what age range it’s for. Design Type: This refers to whether the hockey stick comes in a single piece or if it’s two pieces. This can affect the way that the stick transfers energy to the puck for better range when you’re using it. Material: There are only a few materials that hockey sticks can be made of so that they are durable and useful. Usually, this is a composite material, wood, fiberglass, or some mix of these different things. Type: There are two types of hockey: street hockey and ice hockey. This means that there are two types of hockey sticks. Some sticks work better on the ice and some are meant to be used on the street. Age: The age that the stick is used for affects a variety of factors including how large the stick is and what it’s made of. Children or toddler sticks are usually plastic where adults’ materials vary. Hand Orientation: The hand orientation will matter if you favor a certain hand during the game. Some sticks are curved in such a way that makes them better to use with a certain hand. Keep this in mind while purchasing. Now that you know all there is to know about hockey sticks, we can get to our hockey stick reviews. These sticks were chosen for you so that you don’t have to muddle through, and you’re only seeing the best of the best! Our top pick and budget pick are a great place to start but don’t forget to look at the rest of the list as well. You’ll be sure to find your next great hockey stick! Our top pick is one of the top-rated hockey sticks on the market right now. 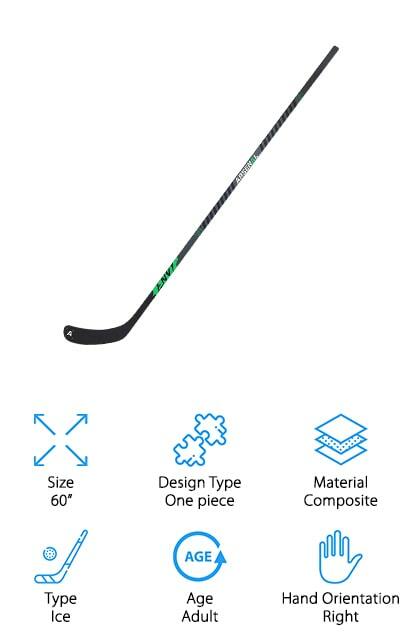 This adult hockey stick by Arsenal is a great professional stick that is made using the best composite materials available to give the same type of performance and durability that you need in your games. 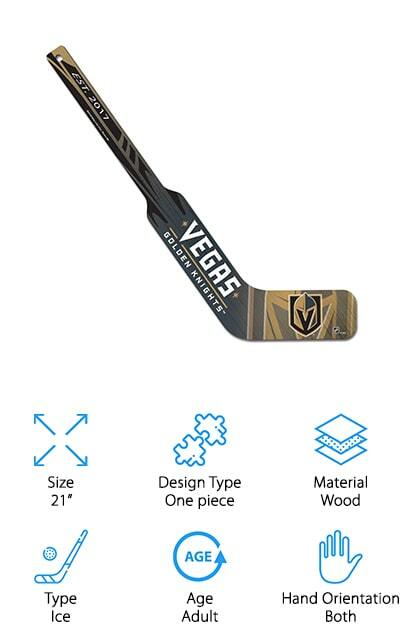 It’s an ice hockey stick so you can definitely use it for hockey on frozen ponds and iced-over streets if that’s what you’d like. But of course, you can also use it for an ice rink that you can play hockey on! It’s balanced really well, and the blade-to-shaft ratio is amazingly accurate. With an 85 flex rating, you can definitely play your best with this stick. The blade pattern matches the most popular and common pattern on today’s market so you get the most out of your game! It also has a left-handed option if that’s what you need in a great hockey stick! Our choice for the best cheap hockey stick is the Eclipse Jet Flo by Mylec. 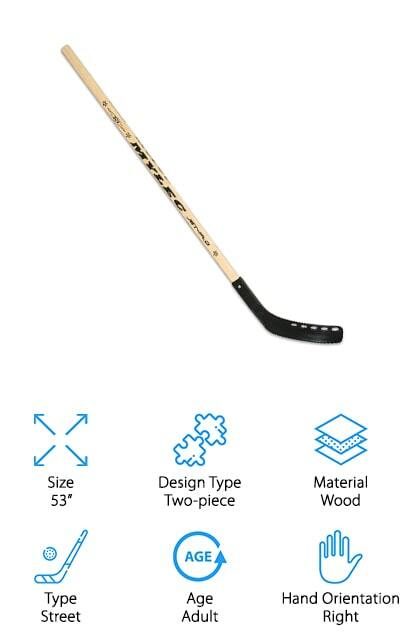 There is a lot of technology that went into the creation of this stick, so we’re sure you’ll love it! It’s perfect for street hockey! Its patented air-flow design makes it so that air moves freely through the holes in the blade. This allows you to make faster shots with a better transfer of energy, propelling the puck hard and fast towards the goal or another player. It’s a two-piece stick that’s attached with screws so it fits securely. The holes also allow less resistance because the air can pass safely through the holes instead of being caught up on the blade. The shaft is wooden, and the entire stick is lightweight enough to be easy to carry while still being heavy enough that you can definitely make an impact on the game. For a perfect pairing with your roller blades, choose this stick! This STX Stick might be one of the best ice hockey sticks that we found during our research. It is completely created with the professional and high-end player in mind. It boasts best-in-class distribution of weight so that the stick is easy to play with and feels great while you’re in the rink. It also provides a great release of energy with its flex profile. This allows the shooting motion of the stick to carry more weight forward. The shaft is made of carbon and glass fibers and designed in a traditional style so you aren’t being held back at all by a change in the shaft style. The blade is made with injected nano resin so that it doesn’t break and using it doesn’t produce microfractures. That’s some pretty amazing technology! Plus, it’s made of a single piece, so that you can feel the entire length of the stick easily, as opposed to how a two-piece stick feels. Liberty Imports makes these amazing hockey sticks for kids, which includes two differently-colored sticks, a puck, and a ball. If you’ve got two smaller children that want to try out hockey in the driveway or the backyard, this is probably the best set for them. Each stick is only 28-inches long, which is perfect for the smallest of aspiring players, and it’s made with light, durable plastic so they won’t hurt themselves. They can still get a pretty good run at a mock game, though! We love that they make these such a fun little set for kids that will give them a great experience playing. It helps them develop their hand-eye coordination skills, as well as being active and exploring the timing and other game-centric ideas. If that sounds like a skill set that you’d like your child to learn, try out these amazing children’s hockey sticks. We’re sure you’ll love them as much as we do! These Cramer Cosom sticks are great for physical education for grades 5 and up. These plastic sticks are made of two pieces, and they are great for the floor, street, and roller hockey. The sticks are light enough to be fun to use, and the blades are made of a high-quality material that won’t mark up your floors when used indoors. The sticks themselves are made of ABS plastic so it’s resistant to impacts and won’t break or splinter easily. They’re durable enough for use with children or adults. They are sold individually, so you can buy as many as you feel that you need, whether you need to outfit an entire team or even two! These affordable sticks are the best choice if you’ve got a large team to put together. Plus, they’re so durable that they’re going to last you a really long time! It’s a great way to get your kids interested! This Franklin Sports Hockey Starter Set includes some of the best hockey sticks for kids. 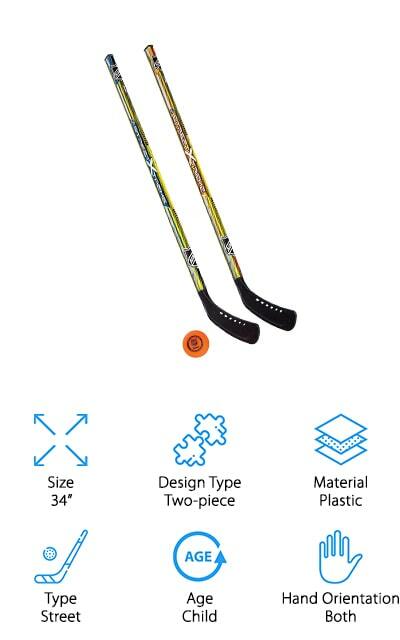 These plastic street hockey sticks come in a pack of two that are 34 inches high, perfect for children and younger teens to play in the driveway or the street with their friends. 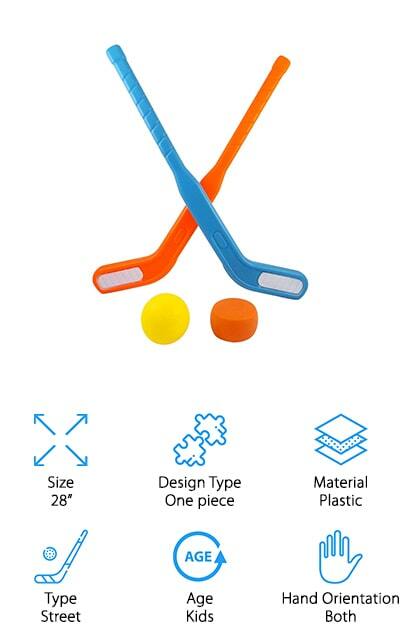 We love the graphic details on these sticks – your kids will be a hit in the neighborhood hockey games! This pack is also perfect if you have two kids who want to play so that they match but they’re also different. One of the best parts about these hockey sticks is that they come with a 65mm low-density ball for use in street hockey, so you won’t have to buy one separately. Both the shaft and the blade of the sticks are made of flexible ABS plastic, so they won’t break easily and they’re great for the rough play that comes with any friendly street hockey game or skirmish. The Frontier 3000 Hockey Stick is a great tool for getting your game started! What we love most about this stick is its versatility – you can use it on the ice rink or in field and street hockey. It’s durable enough to go anywhere! 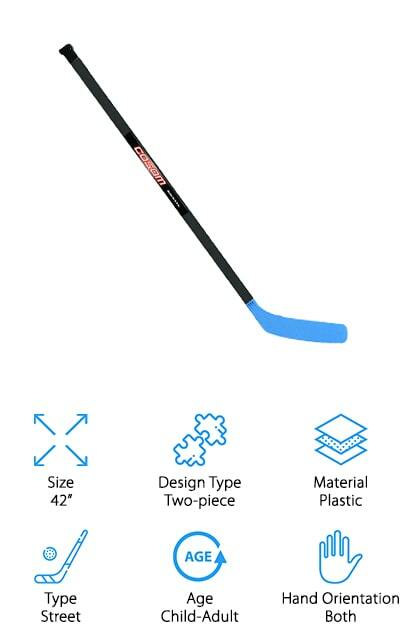 We love that it’s got enough strength for street hockey and the blade is perfect for ice as well. That’s because it’s made with ABS plastic overlaid with fiberglass. It’s solid and will work for your child until he or she is about 5-foot-six. Though this particular stick is right-oriented, it also comes in a left-hand variation. In this way, it’s one of the best hockey sticks for forwards on our list. The versatility of it is more than enough to earn it that title. The shaft of the stick is made of birch wood, so it will definitely give you the power you need to get that puck across the field or rink! These carbon fiber hockey sticks are made of a composite material that is mostly durable carbon fiber so it will take a beating and keep going. They have a mid-kick point, which makes them some of the best hockey sticks for defensemen on the field. It’s recommended to use these sticks on ice only, but you can take them to just about any rink and they will work wonders. The blade is graphite weave over a composite foam core that will give you quick returns and a coating that you’ll love to play with. The shaft is a little stiffer than most with a soft middle, so you can swing it around efficiently and it’s really good at transferring energy. We love the taper to the blade, as it really helps to give you so much power and flexibility with your play. This is a traditional hockey stick with a lot of technological tuning to make sure it’s perfect. Sherwood makes one of the best low kick hockey sticks on the market right now. This youth stick is made of wood with a fiberglass wrapping to help it absorb shock better. It’s durable and lightweight enough to make it fun for children to play! It’s also one of the best sticks for getting your child interested in hockey! It’s got enough aesthetic appeal to be cool as well, with hockey logos up and down the stick. You can show your love of the game without additional modification! At 45 inches, it’s the perfect size for the youth player in your life and is definitely durable enough to make it on and off the ice in one piece! If your child is just learning how to play hockey, this is a great gift to get them started off in the right direction! The younger players in your life will sure love this one-piece wooden stick with plenty of power! 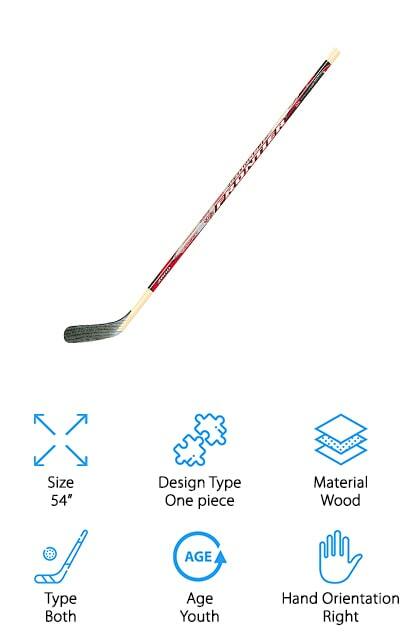 This miniature hockey stick by WinCraft is the perfect gift for the goalie in your life! It’s made of solid wood hardboard and decorated with the logo of the Las Vegas Golden Knights, as well as graphics with their team colors. It’s a stylish way to represent your favorite team! Although it’s mainly a showpiece, it’s still solidly designed. WinCraft is a well-known company that makes really great fan gear, and the Golden Knights fan in your life will not be disappointed. It’s officially licensed and perfectly realized in printing, design, and quality. It’s a wide goalie-style 21-inch stick that’s smaller than a normal stick for display and representative reasons! We love how well this stick comes together, how it looks and would function like the real thing – and that’s exactly why it works so well as a hockey stick that you can display and represent your favorite team. It’s a pretty amazing gift!